The Datsuns’ origins are in Trinket – a high school band in formed in Cambridge in 1997. They renamed themselves in 2000 and made an immediate impression in Britain – hailed by the English music press and recording sessions for John Peel’s BBC radio show. John Paul Jones of Led Zeppelin produced their second album and Lars Ulrich of Metallica has also praised them. Dolf de Borst says of their music, “It can be too light for people into heavy metal, and too heavy for people into straight garage - we purposefully make it so it doesn't fit into one place”. Trained at Ilam School of Fine Arts, John McDonald cut his teeth directing at TVNZ in the 80s before producing sport for Sky TV. An OE producing at MTV Asia was followed by roles for Screentime. 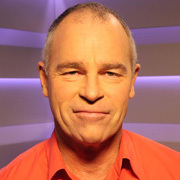 Since joining Mediaworks (TV3) in 2000, he has led an award-winning run of live coverage (Fight for Life, Rugby World Cup, the NZ Music Awards) and comedy. He is Head of In-House Production at Mediaworks.